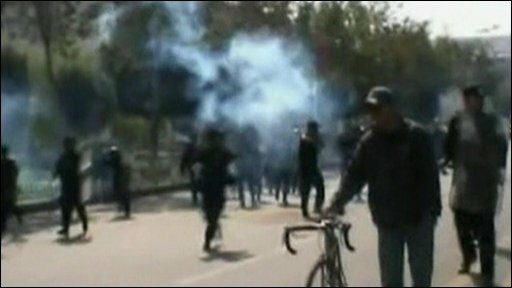 Riot police in the western Chinese city of Urumqi have used tear gas to disperse crowds in a third day of protests over public safety fears. There has been growing anger over attacks with hypodermic needles. Han Chinese in the city say they have been targeted in the attacks. They are also calling for quicker trials for people charged in July's ethnic riots. Almost 200 people, most of them Han Chinese, were killed in violence with ethnic Uighurs in Urumqi. Chinese authorities blame Uighur separatists for July's violence, saying it was orchestrated by Uighur separatists in exile. Xinjiang's population is split between mainly-Muslim Uighurs and Han Chinese - the country's majority ethnic group. The BBC's Michael Bristow, in Urumqi, describes the situation as tense, as riot police move around the city to break up angry crowds gathering at intersections. Police were guarding the central People's Square - scene of a large demonstration on Thursday - and waiting at roadblocks and in lorries parked on side streets. There were scuffles at one intersection as police moved in to arrest several protesters, our correspondent says. Authorities have announced a ban on "all gatherings, marches or protests on roads or other public venues," the state-run Xinhua news agency said. Large numbers of police were deployed overnight in the city after tens of thousands of Han Chinese protested in central areas on Thursday. A series of unexplained stabbings using hypodermic syringes appears to have triggered the protests. Chinese media said that nearly 500 people, almost all Han, have sought treatment for stabbings in the past few weeks. Reports said 89 people had "clear syringe marks" but that no-one had been infected or poisoned. 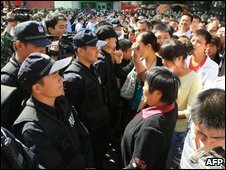 A businessman in Urumqi told the BBC on Thursday that many members of the Han community had joined the demonstrations. Another Han resident said he was concerned for his safety. "The local government is not doing enough to protect Han people there... I am really [worried about] my family and relatives there. [The] Chinese government should do more to prevent this," he told the BBC. There is also anger over what many perceive as official slowness in punishing suspects charged for July's riots. Protesters have accused the provincial government of being "useless", and some even called for the dismissal of regional Communist Party boss Wang Lequan, who is thought to be an ally of President Hu Jintao. The tension between Xinjiang's Uighur and Han communities has been simmering for many years, but the ethnic unrest in July was the worst in China for decades. The violence began on 5 July when an initially peaceful protest by Uighur youths, apparently prompted by an earlier riot in a factory in southern China, spiralled out of control - with shops and vehicles burned and passers-by attacked. About 80 people have been charged over the violence but no date has been set for their trial. Are you in Urumqi? Have you witnessed or heard of the unrest? Send us your experiences using the form below.